What is an AC separation? 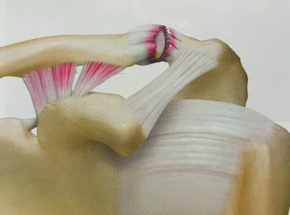 An acromioclavicular joint separation, or AC separation, is an injury where the clavicle (collar bone) separates from the scapula (shoulder blade). 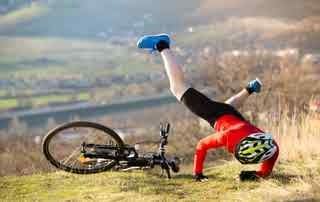 AC separation is caused by a fall directly on the edge of the shoulder or a direct blow received in a contact sport. Football, soccer, and hockey players as well as cyclists most commonly sustain AC separations. Grade I – Slight displacement at AC joint. 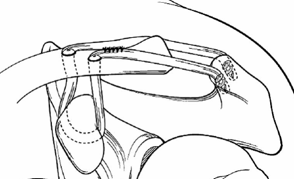 The acromioclavicular ligament is stretched. This is the most common type of injury to the AC joint. 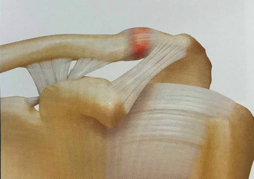 Grade II – A partial dislocation of the AC joint. The acromioclavicular ligament is completely torn, while the coracoclavicular ligaments remain intact. Grade III – A complete AC separation. The acromioclavicular ligament and the coracoclavicular ligaments are fully torn. The shoulder has an obvious. Grade V – A complete separation of the AC joint with disruption of deltoid and trapezial muscle fascia. 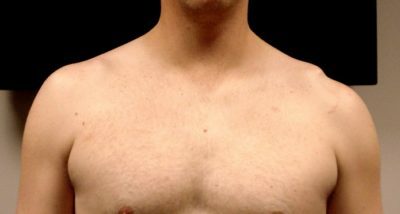 This severe separation demonstrates the most obvious visual bump on the shoulder. What are the symptoms of an AC joint separation? Tenderness at the AC joint when touched. Initial bruising and swelling around joint. A bump on the top of the shoulder. How does Dr. Ahmad make the diagnosis? Physical appearance often reveals deformity. X-rays show the AC separation. MRI shows the ligaments disrupted and allows evaluation of other structures such as the shoulder labrum. How does Dr. Ahmad treat AC separations? The treatment of an AC separation depends on the grade of the injury. Grades I – II are usually treated non-operatively. Grade III AC separation patients may be candidates for early surgical reconstruction based on the patient’s sport and level of play. Some Grade III separations which are unstable with arm movement or when symptoms persist despite non-operative treatment. Ice to reduce pain and swelling. Rest and wear a protective sling until pain subsides. This usually takes about 1-2 weeks. A rehabilitation program to restore normal motion and strength. 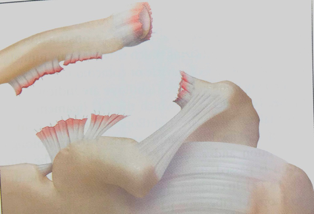 Depending on the grade of injury, most patients heal within 2 to 3 months without surgical intervention. The patient returns to sports when full strength and painless range of motion is achieved. Surgery may be elected when symptoms persist after 2 to 3 months for low grade AC sprains. 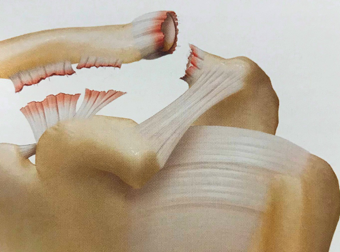 Early surgery for a select group of Grade III AC separations may be based upon the patient’s sports, seasonal timing, and if dynamic instability is present. The use of a sling is required for 6-8 weeks. 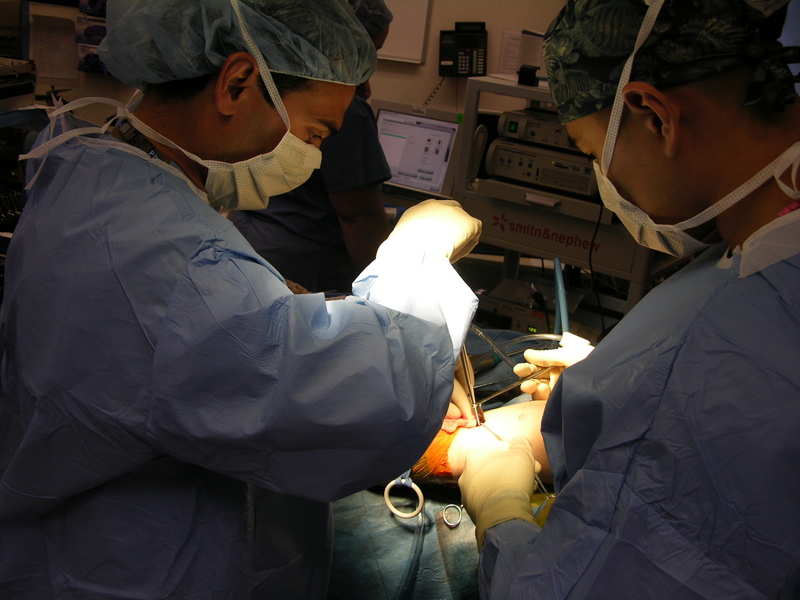 Stitches are usually removed 7 – 10 days after surgery. Overhead motion is limited for the first 8-12 weeks. After the removal of the sling, 6-8 weeks of physical therapy is necessary to regain full motion. Strength and velocity motions of the throwing athlete may be delayed for 4-6 months.